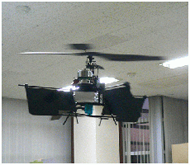 This product is a rotor MAV that enables hovering and reliable flying using a rotor. 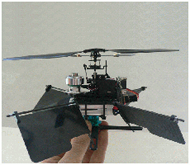 This product enables hovering at 30cm or less and 160g or less. 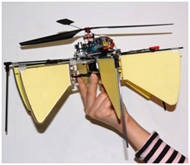 This product enables directional control. 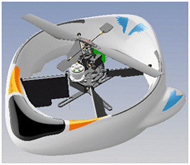 The product changes direction using the back current that causes anti-torque rather than via tail or coaxial rotors, and freely flies to the desired place by performing autonomous, reliable hovering. If needed, this product can feature cameras or sensors.